After quite a bit of development the next generation of PULP systems are here. Mr. Wolf is an IoT processor using optimized RISC-V cores. One cluster with eight 32bit RISC-V cores (RI5CY) supporting ICMF extensions. Two IEEE-754 compliant FPUs each shared by four cores. 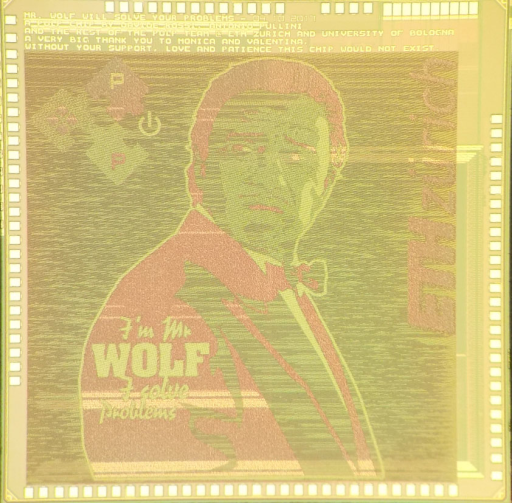 Mr. Wolf features a 108uW fully retentive memory (512 kByte). The I/O subsystem is capable of transferring up to 1.6Gbit/s in less than 2.5mW. The 8-core compute cluster achieves a peak perfromance of 850 millions of 32bit integer multiply and accumulate per second (MMAC/s) 500 millions of 32-bit floating point multiply and accumulate per second (MFMAC/s). As well as an efficiency of 15 MMAC/s/mW and 9 MFMAC/s/mW. Mr. Wolf continues our tradition of naming chips from characters from the movie Pulp Fiction by Quentin Tarantino. Mr. Wolf solves problems, and this is exactly what we believe this chip will do. An ultra-low power IoT chip that can be used in many different applications.